That's it for today's live text coverage, but stay on this page for live BBC local radio commentary of the ongoing WSL games at Chelsea and Manchester City. Katie McCabe's second-half strike for Arsenal proves enough in a keenly contested game at Solihull. They're now four points clear of Man City at the top of the WSL. City are taking on Liverpool this afternoon. It's a significant win for Arsenal too, as it guarantees they'll be playing Champions League football next season. Bravo. Arsenal keeping the ball in the corner and winning throw-ins brilliantly here. This one should be all over now. Goalscorer Katie McCabe is replaced for Arsenal by defender Tabea Kemme. What we have we hold. Just 90 seconds or so to go. Dominique Bloodworth wins a free-kick for Arsenal on halfway to eat up some time. Into four minutes of stoppage time. A few subs have been made, Arsenal have brought on Danielle Carter for Beth Mead, Blues have taken off Chloe Arthur and Emma Follis for Claudia Walker and Connie Scofield. Blues pushing but not creating anything yet. Arsenal standing firm as time runs out. Another sub for the Gunners as Danielle van de Donk is replaced by Viktoria Schnaderbeck. Four minutes to play and as things stand, Arsenal will have a four-point lead at the top over Manchester City, who are still goalless with Liverpool. About 15 minutes gone in that one. Katie McCabe very nearly doubles her tally and Arsenal's lead, but this time her close-range effort is bundled behind by Blues keeper Hannah Hampton. The game is so stretched though. Arsenal's forwards are getting lots of space on the counter. Brilliant play from Katie McCabe. She's going to drive infield and get her shot off. This time it takes a nice bounce, she gets around Aoife Mannion and puts her shot into the bottom corner to give Hannah Hampton no chance. See below post - commentator's curse is a real thing! Birmingham have had all the play of late, but Katie McCabe races up the other end on the break and cuts in from the right before drilling home with her left foot superbly. In fairness, the Arsenal forward went close about 60 seconds before that as well so she gave a warning out. What a HUGE goal that could be in the WSL title race. I just want to remind you it's ARSENAL who are top, ARSENAL who have won their last four games and ARSENAL who are just three wins from clinching the WSL title. For about 15 minutes now, Birmingham have given them the absolute runaround. Fair play to Blues - they're going for it. Chloe Arthur should score for Blues! She glances a header at the back post after a superb right-wing free-kick and watches it bounce inches wide. Birmingham's best chance of the game, no doubt. All of a sudden it's Blues who are well on top. (Arsenal's Katrine Veje was booked for the foul that led to that free-kick by the way). Great pressing from Birmingham leads to some dodgy Arsenal defending. 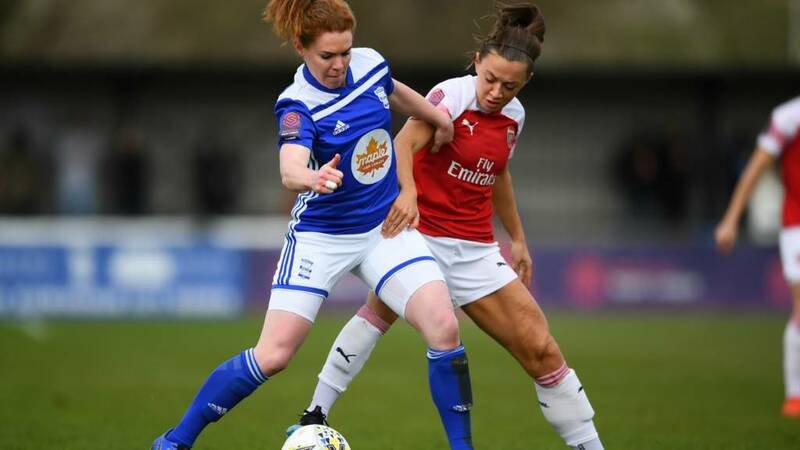 Blues' Hayley Ladd heads the ball on to Ellen White who misjudges the bounce of the ball when she could've got a shot away, and Arsenal survive. This has been almost a carbon copy of the first half. Arsenal started strongly, but Birmingham have got to grips with it and it's now pretty even. We're about to get under way in three more WSL matches - two of which you can listen to by clicking on the coverage options at the top of this page. You can hear commentary of Manchester City v Liverpool and Chelsea v West Ham courtesy of BBC Radio Manchester and BBC Radio London respectively, and I'll bring you news of any goals elsewhere before the end of the Blues v Arsenal match. Hayley Ladd is the second Blues player in the referee's notebook after a clumsy challenge. Great play from Ellen White for Birmingham, and suspect refereeing. A superb touch from the England striker sees her pluck a ball out of the sky and drive towards goal before being bundled over by a combination of Arsenal defenders just outside the box. The game really is opening up now. It's like attack v defence in both halves of the field.